Your day-by-day itinerary now includes Ko Olina Lagoons. Get in touch with nature at Scuba & Snorkeling and Makapuu Lighthouse Trail. Your inner history buff will appreciate National Memorial Cemetery of the Pacific and Byodo-In Temple. 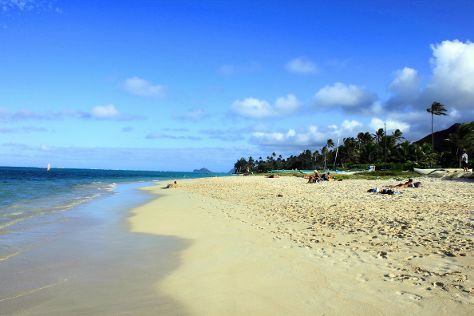 Explore the numerous day-trip ideas around Honolulu: Kailua (Lanikai Beach & Kailua Beach Park) and Waimea Valley (in Haleiwa). There's still lots to do: hike along Koko Crater Railway Trail, appreciate the views at Nuuanu Pali Lookout, paddle through the water with a kayaking and canoeing tour, and stroll through Kapiolani Regional Park. To see where to stay, maps, reviews, and more tourist information, refer to the Honolulu trip planner . Montreal, Canada to Honolulu is an approximately 14.5-hour flight. You can also do a combination of bus and flight; or do a combination of train and flight. The time zone changes from Eastern Standard Time (EST) to Hawaii Standard Time (HST), which is usually a -5 hour difference. Traveling from Montreal in January, things will get much warmer in Honolulu: highs are around 32°C and lows about 22°C. Finish your sightseeing early on the 9th (Thu) to allow enough time to travel to Hanalei. Hanalei is a census-designated place (CDP) in Kauai County, Hawaii, United States. You'll discover tucked-away gems like Hanalei Beach and Kalalau Trail. Visiting Na Pali Coast State Park and Queen's Bath will get you outdoors. There's still lots to do: identify plant and animal life at Kilauea Point National Wildlife Refuge, enjoy the sand and surf at Anini Beach, take in the dramatic scenery at Hanakapiai Falls, and take a memorable drive along Hanalei Valley Lookout. To find photos, ratings, traveler tips, and other tourist information, you can read our Hanalei trip maker site . Traveling by combination of flight and taxi from Honolulu to Hanalei takes 3 hours. January in Hanalei sees daily highs of 30°C and lows of 21°C at night. Finish your sightseeing early on the 12th (Sun) so you can travel to Volcano. Start off your visit on the 13th (Mon): take in the dramatic natural features at Thurston Lava Tube (Nahuku), then trek along Kilauea Iki Trailhead, then get impressive views of Kīlauea, and finally see the interesting displays at Jagger Museum. For other places to visit, traveler tips, reviews, and tourist information, read our Volcano road trip site . Traveling by flight from Hanalei to Volcano takes 5.5 hours. Alternatively, you can do a combination of flight and bus. Expect a daytime high around 32°C in January, and nighttime lows around 20°C. Wrap up your sightseeing on the 13th (Mon) early enough to travel to Kihei. 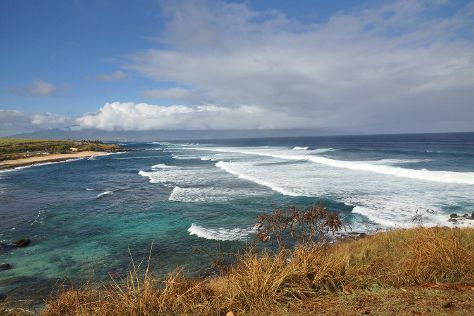 Explore hidden gems such as Kamaole Beach Park II and Kapalua Beach. Escape the urban bustle at Kamaole Beach Park III and Kayaking & Canoeing. Explore Kihei's surroundings by going to Lahaina (River Rafting & Tubing & Waiola Church & Waiola Cemetery). There's lots more to do: kick back and relax at Ho'okipa Beach Park, discover the deep blue sea with a scuba or snorkeling tour, look for all kinds of wild species at Honolua Bay, and stroll through Wailea Beach Path. To find maps, photos, reviews, and tourist information, use the Kihei trip planning website . You can fly from Volcano to Kihei in 4.5 hours. Another option is to do a combination of bus and flight. In January in Kihei, expect temperatures between 32°C during the day and 20°C at night. Cap off your sightseeing on the 17th (Fri) early enough to travel back home.